Skippers come in all sizes, shapes, sexes, nationalities, personalities and every other character trait you can think of. The one thing that they have in common is that they are licensed by the government to responsibly handle the yacht. They are well- trained and have a lot of experience. Although they are not trained as "guides". They know Greece intimately and will be able to show you places you'd never find on your own and introduce you to life in Greece. 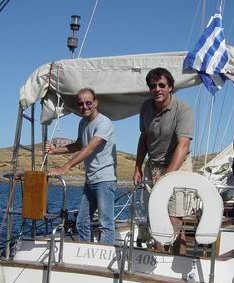 On the long sails between islands, your discussions will enlighten you about many aspects of life in Greece and walks through the islands will be a field trip. In a few articles, a specific skipper is named and I often get requests for that skipper. All skippers have their strengths and weaknesses and it's hard to select the "best". When you read a story about a skipper that someone thinks is "great", remember that you don't know the person who is writing the story...so as great as the skipper sounds, he may not be the "best" skipper for you. The point being, you have just as much chance of randomly selecting a skipper who is great for you as you do selecting a skipper that someone else say was great. I don't believe that the choice of skipper will make or break your trip. As a matter of fact you could take 10 charters with 10 different skippers and have 10 different but equally "great" trips. So don't spend too much time trying to secure a particular skipper.... if he's available, we'll try to get him. If not, you're still going to have a great time on your charter.